One of the best simple pleasures in life is tarator (таратор). If you are Bulgarian you already know that. If not, you should read carefully. In Bulgaria we LOVE to eat/drink tarator during spring and summer. 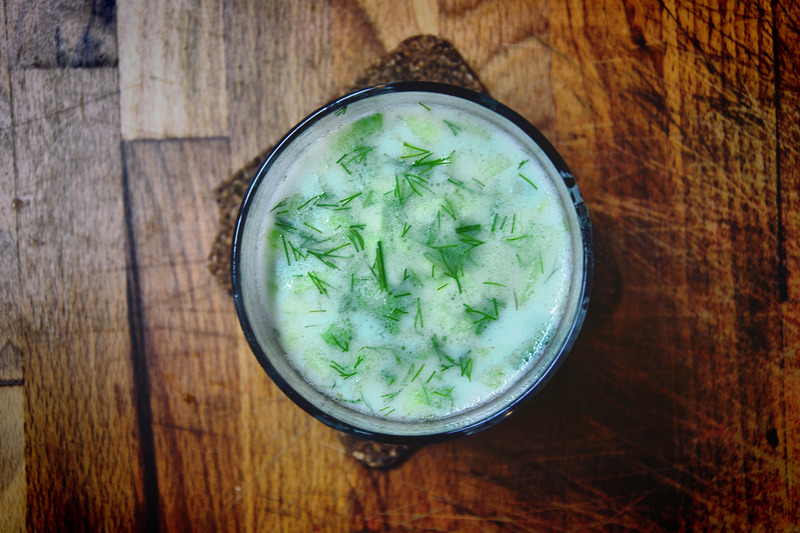 Tarator is a cold soup made with Bulgaria yogurt and cucumbers. You can eat tarator from a bow with a spoon just like eating а normal soup; you can drink it from a cup like most people do; or at the seaside, you can even drink it like a “cocktail” with a straw (which is actually pretty weird, but whatever you like… it’s your tarator!). Slice the cucumber(s) in small cubes and put them in a bow. Cut/smash the 2 garlic cloves. Put them in the bow. Cut the fresh dill -> in the bow. Pour some olive oil and put salt up to your taste. Then, when you have all those ingredients ready in the bow, you just need to put the Greek yogurt and mix it altogether. You need to add some cold water to make it more liquid. Make it as liquid as you wish. Ready! The classic Bulgarian tarator is made with garlic, but if you don’t like it you can always skip it – it will still be a tarator. Walnuts are usually added at restaurants when the tarator is being served as the first course. Trator is refreshing and a real life saver in the hot summer days. We totally recommend you to try it! Greek yoghurt..? Wtf. Its a BULGARIAN yoghurt in it, folks! It’s bulgarian yoghurt and it has its own name: Kiselo Mliako (Кисело Мляко) or literally translated: Sour milk!